On Tuesday Pinterest announced the rollout of buyable pins – featuring the site’s first ever buy button – over the next several weeks. This move comes after recent buy button announcements from Facebook, Twitter, and Google. But since Pinterest is arguably the most shopper-friendly social platform around, the potential of this particular button is much more exciting than those of its predecessors (at least to ecommerce geeks like us). 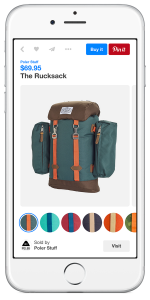 What we know so far: Pinterest’s “Buy it” button will take the form of a small blue button next to the original red “Pin it” button, users can browse options (like colors and sizes) right on the page and pay with Apple Pay or a credit card without ever leaving the platform, shipping methods will be automatically pulled from the retailer, and perhaps most notably, buyable pins will be mobile-only at launch. Pinterest is a platform of discovery showcasing the latest fashions, recipes, and home décor trends. Users aren’t sharing selfies or updating their statuses; they’re actively searching for their next project, recipe, or cute pair of shoes. The very nature of the platform means users are in a product-oriented, maybe-even-buying mindset, which is key for driving ecommerce. 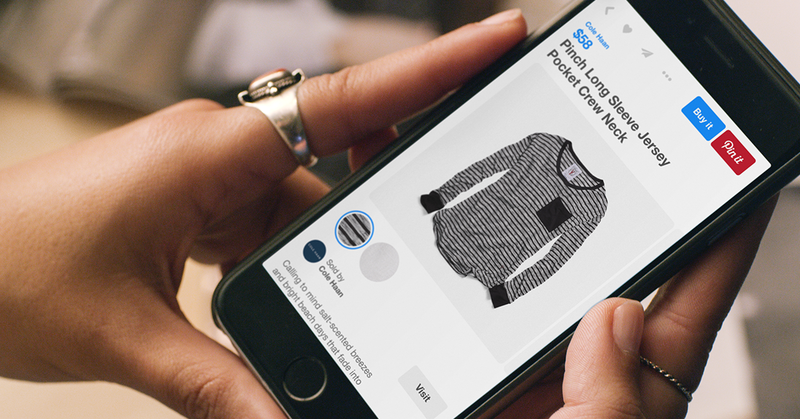 Pinterest’s very nature already lends itself to shopping more than any other network. With new buyable pins, users will be able to take advantage of a unique (and familiar) environment where they can discover a product and immediately buy it with very little friction to keep them from converting. 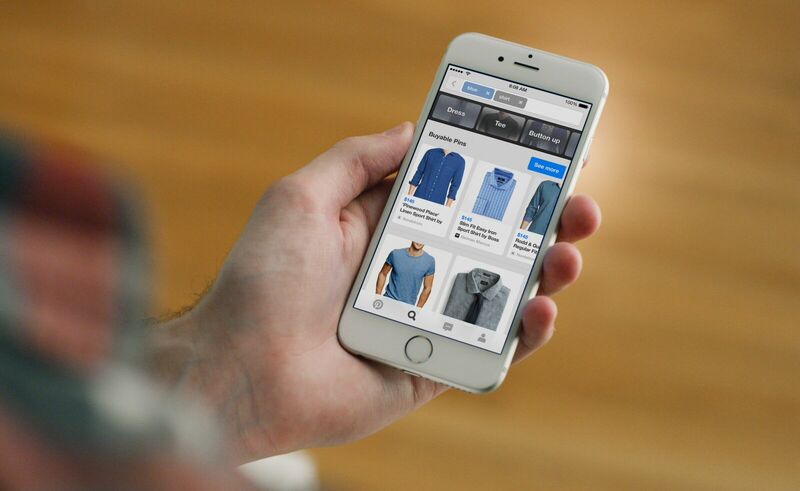 Pinterest has always been a primarily mobile platform – 75% of daily Pinterest traffic comes from mobile apps alone – but mCommerce has historically struggled with checkout. In fact, some reports have mobile cart abandonment as high as 97%. Luckily it appears Pinterest has done its homework. 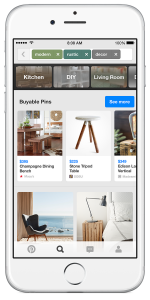 According to the announcement, iPhone and iPad users will be the first to shop on Pinterest, with Android and desktop rollouts to follow. Shoppers will be able to browse by color, size, and style on the pin itself, and will only have to enter payment and shipping information once – Pinterest will store users’ data for future use. Shoppers will be able to complete a purchase from any retailer without having to leave Pinterest and sign in or create a new account on a mobile device. 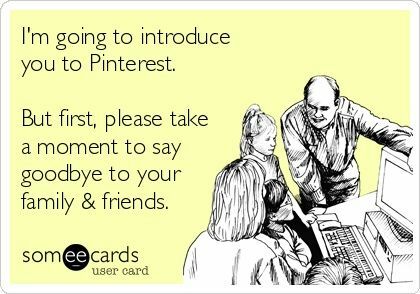 Pinterest’s mobile-first strategy is a perfect fit for the platform. “Promoted” posts on social platforms have traditionally been offered to big businesses first and then slowly trickled down to other retailers, leaving small and midsize retailers feeling late to the party. However, new buyable pins could actually help level the ecommerce playing field, and it seems this is by design. Shopify, a web store platform popular with small businesses, is one of only two checkout partners integrated with the new feature at launch. With the exception of brand recognition, small, medium, and big businesses will have equal footing with buyable pins. Big retailers will benefit from reduced friction on mobile purchases, while smaller stores will benefit from both reduced friction as well as the added sense of trust that comes from being associated with the Pinterest platform. This is a huge win for small ecommerce companies. Today’s price for making your business’s pins buyable? Absolutely free. That being said, the option might not be free forever – Google Shopping began as a free listing and eventually moved over to a paid model. We suggest you sign up sooner rather than later to take advantage of this freebie while it lasts. Looking for a more insights? 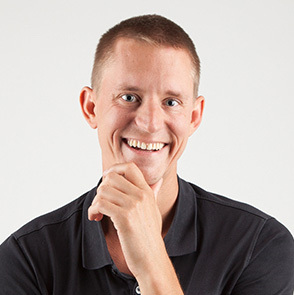 Checkout Ripen’s Pinterest for ecommerce blog post or download our Pinterest URL generator, which was featured on HubSpot.